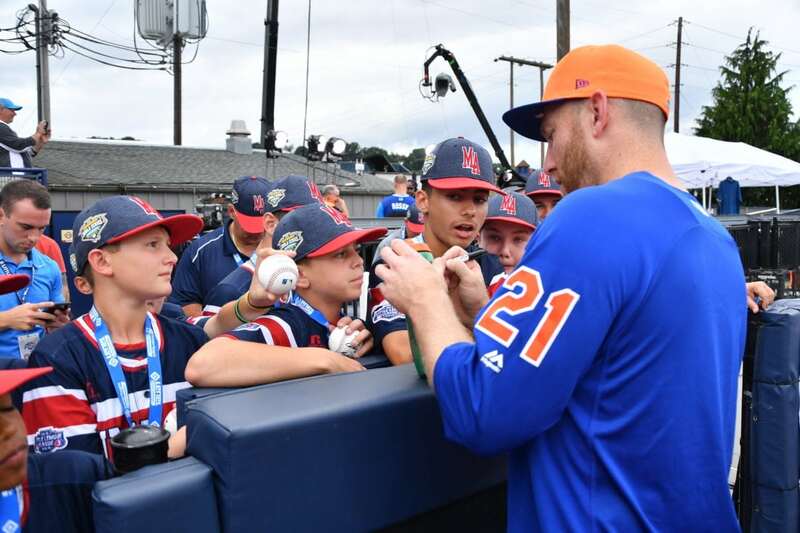 MARK NANCE/Sun-Gazette The New York Mets’ Todd Frazier signs autographs for members of the Mid-Atlantic Regional champions from Staten Island, New York, on Sunday at Bowman Field. Todd Frazier always makes sure the TVs in the Mets clubhouse are turned to Little League World Series games. Even 20 years after he led Toms River, New Jersey, to a world championship, the tournament is still part of him. Sunday afternoon, he shared the place which holds such a special place in his heart with his family. His children followed him around South Williamsport’s Little League complex wearing T-shirts with his No. 21 and his nickname, Toddfather, emblazoned on his back. They sat in his lap as he addressed the media about what it was like to be back at the home of the Little League Baseball World Series for the first time since he was the winning pitcher in the 1998 championship game. A smile never left his face. Frazier was one of three former Little League World Series players who returned to Howard J. Lamade Stadium on Sunday for the first time since they played there. Frazier’s Mets teammate Michael Conforto and Phillies infielder Scott Kingery were all presented with portraits by Little League President and CEO Steve Keener commemorating their time both as Little League World Series players and Major League Baseball players. All three lamented how their time playing in the World Series — Frazier in 1998, Conforto in 2004 and Kingery in 2006 — helped springboard them to the big leagues. It was the second year in a row three players who played in the MLB Little League Classic were alums of the Little League World Series. The St. Louis Cardinals’ Lance Lynn and the Pittsburgh Pirates’ Max Moroff played in the first Little League Classic and were alumni of the Little League World Series. The nerves still got to Frazier even after all he’s done in his baseball career since guiding Toms River to a title. He was scheduled to throw out the first pitch at Lamade Stadium prior to the United States winners’ bracket game between Michigan and Hawaii. He stood on the field next to his covered portrait stretching his arm. When he stepped forward to throw the first pitch, he stood in front of the pitching mound before being coaxed back to the rubber by his Mets teammates, who surrounded home plate. Frazier did deliver a strike to Alfred Delia, known better on social as Big Al who hits dingers. Delia had himself quite a day. He caught the first pitch from Frazier and spent some time talking with Phillies left-fielder Rhys Hoskins. The two recorded a video for Twitter talking about their shared love of hitting dingers. Kingery’s experience at the Little League World Series more than 10 years ago was a little different than either Frazier’s or Conforto’s. Not only did he help his team to a 2-1 record, he got to share it with his dad, Tom, who was the team’s coach, and his twin brother, Sam, who was his double play partner. Tom and Sam sat in the gallery Sunday during the press conference. They nodded along with Scott as he talked about seeing the field for the first time. They smiled as he recalled how much it meant to him to share the experience. After playing parts of four seasons in the big leagues, Conforto said seeing the Little League World Series up close again puts his job back in perspective. Instead of worrying about finishing out what has been a dreadful season for the Mets, they were able to go back in time and remember the feeling of playing the game just because it was fun. Conforto and his teammates lived that throughout the day. Snapping selfies with the Little Leaguers, signing autographs and laughing as much as they could. For Conforto, he knew what to expect from the experience of coming back to South Williamsport and he was happy to share it with teammates who had never been there.